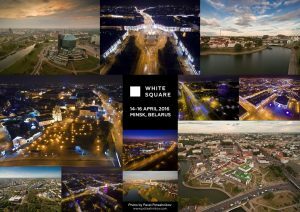 VIII White Square International advertising festival – one of the most ambitious and dynamically developing creative festivals in Eastern Europe – will be held in Minsk, Belarus on April 14-16. Every year the festival gathers the representatives of more than 25 countries of Europe. Over 1,000 entries participate in the contests. Over 700 delegates – in business and educational program. A huge event for the upcoming festival is a visit of Amanda Benfell, the representative of world’s most prestigious creativity rating The Gunn Report which annually announces the most awarded works, agencies, networks, countries and clients globally. VIII White Square includes five main contests and jury categories: Creative, Branding, Digital, Marketing, Social Advertising. The jury consists of persons with world recognition in advertising and rich experience of judging at famous international ad festivals, holders of numerous prestigious industrial awards, including Cannes Lions. Submission of entries goes on adfest.by. THE DEADLINE IS ON MARCH 28! One entry fee (without VAT) is: Creative, Branding, Digital, Social Advertising Contests – 110 EUR, Marketing contest – 150 EUR. The winning entries will be published on over 30 leading professional online resources of Europe and the CIS during April-May 2016. For the first time this year one of the best entries of the festival will be awarded with a special industrial press award – Epica White Square Award – with the right of further free participation in Epica 2016, and a special discount for other best 24 entries participating in White Square. LEVEL UP! – says this year festival’s slogan offering all the participants to reach a higher level of professional thinking. VIII White Square has a various business and educational program that will include more than 60 different activations: master-classes, round tables, workshops, seminars and show-lectures held by leading experts of communications industry from 20 European countries. Plus of course parties with national Belarusian dishes and drinks, city tours around Minsk and of course inspiration, bright acquaintances and useful contacts! View the PROGRAM OF VIII WHITE SQUARE FESTIVAL. Detailed information is provided on official website adfest.by .